From vegetable garnish to grandes sallets, this is an appetizing history of salads. It is also a book about changing attitudes and evolving lifestyles, as raw greens and fresh vegetables have become appreciated as healthy eating choices. What is it about a salad that has made it an essential food? Originally assembled from wild plants gathered from hillsides, they weren’t considered particularly nutritional in ancient times but they always provided a contrast in texture, taste and heat (or lack of it) to the main meal. 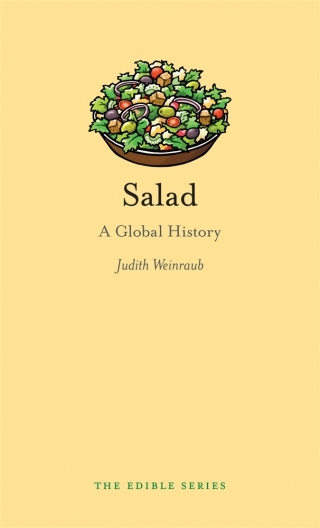 Judith Weinraub reveals how salads were given their own place in a meal, sometimes before the main meal, sometimes as the entire meal, and sometimes as a last course, and how, over time, salads have morphed into a highly valued separate dish across the world. Truly global in scope, Salad describes the development of salads across Europe, the Americas and Asia. It is essential reading for food historians and food lovers everywhere. Judith Weinraub is an independent writer, editor and oral historian. A longtime reporter and section editor at the Washington Post, she is a two-time winner of writing awards from the James Beard Foundation in New York City.